Jayson Wynters - Industrial Espionage. Vinyl EP. Bleep. A year on from his debut EP for Don’t Be Afraid (Karen Gwyer, Rroxymore) and Jason Wynters delivers another idiosyncratic four-track for the label. The Birmingham DJ’s slippery style is hard to pin down. Though he deals largely in deep house, techno and acid, there is something about the way Wynters jumps between them that makes Industrial Espionage such an intriguing release. Opener ‘Beta (Version)’ blossoms from a percussive house roller ala Fingers Inc. into a dubby second half. The same structure is applied on ‘One Hundred N Forty’, though the track does in a highly unusual techno style running at (you guessed it) 140 bpm. 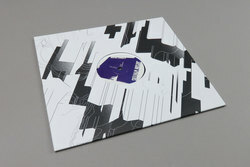 B-sides ‘Into The Void’ and ‘The Kansei Method’ are both prime pieces of acid techno - while the latter unfurls slowly over eight minutes, the former is a relentless assault of 303s and 909s.